One of the evidences that Jesus will soon return at the end of this age is that Spiritual signs will abound. One of the negative spiritual signs is the rise and acceptance of Satanism. Satanism in the form of witchcraft, New Age, and the occult were prophesied to become mainstream, and so they have. Paul writes in 1 Timothy 4:1 that "the Spirit explicitly says that in the latter times some will fall away from the faith, paying attention to deceitful spirits and doctrines of demons." Take this story, for instance, by WorldNetDaily titled "6-6-Sick: Teens Dismembered in Satanic Slaughter" (September 15, 2008). "Eight suspects have been detained by police in Russia for the alleged satanic ritual killing — and cooking — of four teens, according to a report in the London Daily Mail. Police in the Yaroslavl region northeast of Moscow told the newspaper the victims — three girls and one boy — were stabbed 666 times each, dismembered and cooked on a bonfire in the satanic ritual. Satanists link the number 666 with Satan. The Daily Mail said police reported the victims' limbs, hearts and other body parts were severed and dumped in the pit along with a small rodent that was crucified on an upside-down cross. The victims all were described by police as Goths, ages 16 and 17, and authorities said they apparently were forced to get drunk before the murders." Was that just an isolated incident of Satanism? How about 48,000 people who gather every year on the summer solstice for a ritual burning of a 40-foot effigy of a man in an event called the Burning Man? Meeting in Black Rock Desert in northern Nevada under the guise of an art show, according to their website at burningman.com, participants enter into "an experiment in community, radical self-expression, and radical self-reliance" to "encourage the individual to discover, exercise and rely on his or her inner resources." Such "radical expression" involves naked ceremonial dancing, open sexuality, tarot card readings, earth goddess worship, shamanism, Wiccan counselors and other forms of occultism. Satan's goal is to drag as many people as he can with him on his way to Hell. For those who can't stomach his desire with openly flagrant Satan worship, much of today's Satanism is repackaged under supposedly harmless guises such as New Age philosophy, Wiccan earth spiritualism, extreme environmentalism, meditation, yoga, out-of-body experiences and channeling. Satanism is packaged to our children in seemingly innocuous books like Harry Potter and Twitches, and television shows like Totally Raven and Buffy the Vampire Slayer. Any children's section of Barnes and Nobles or other major bookstore chain is dominated by books with a magic theme aimed at early indoctrination into the occult. What did those Goth teens who sacrificed their peers to Satan read when they were kids? What does God have to say about people who participate in satanic worship? In Leviticus 19:31 God stated, "Do not turn to mediums or seek out spiritists, for you will be defiled by them. I am the LORD your God," and in "Leviticus 20:6, "I will set my face against the person who turns to mediums and spiritists to prostitute himself by following them, and I will cut him off from his people." And for those who practice Satanism, Deuteronomy 18:10-12b states, "Let no one be found among you who sacrifices his son or daughter in the fire, who practices divination or sorcery, interprets omens, engages in witchcraft, or casts spells, or who is a medium or spiritist or who consults the dead. Anyone who does these things is detestable to the LORD." Under the Mosaic Law in Leviticus 20:27, "A man or woman who is a medium or spiritist among you must be put to death. You are to stone them; their blood will be on their own heads." God feels that strongly about engaging in any level of Satanism. 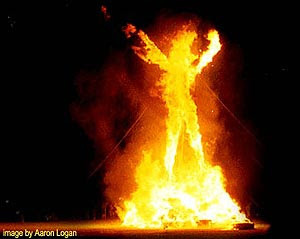 The Bible says the ultimate destination of anyone who engages in any form of Satanism will be to become a real "burning man" in the Lake of Fire. Jesus proclaims in Revelation 21:8 (NIV), "But the cowardly, the unbelieving, the vile, the murderers, the sexually immoral, those who practice magic arts, the idolaters and all liars—their place will be in the fiery lake of burning sulfur. This is the second death." So, while Satanism grows in its openness and acceptance in society in preparation for Satan's direct world rule through the Antichrist, those who love what is good can find great solace in Jesus' upcoming and completed victory over Satan. In the end time, the world moves progressively toward COMPLETE evil. The entire world’s leadership will follow the beasts of Revelation 13. At the Sixth Plague the world is so completely evil that we see the Devil WITH the two beasts of Revelation 13 prior to the battle of Armageddon (Re.6:12-16 below). The Devil will be manifested in the flesh as Gog. Re.16:12 And the SIXTH angel poured out his vial upon the great river Eu-phra-tes; and the water thereof was dried up (Jer.51:36 below), that the way of the kings (Re.17:12-14) of the east might be PREPARED. Re.16:13 And I saw three unclean spirits like frogs come out of the mouth of the dragon (Re.12:9, Re.20:2, Re.9:11), and out of the mouth of the beast (Re.13:1-8), and out of the mouth of the false prophet (Re.13:11-17). Re.16:14 For they are the spirits of devils, working miracles, which go forth unto the kings of the earth and the whole world, TO GATHER THEM TO THE BATTLE OF THAT GREAT DAY OF GOD ALMIGHTY (Re.19:19). Re.16:16 And he (the Sixth Plague angel) GATHERED THEM TOGETHER INTO A PLACE (Jer.51:49) called in the Hebrew tongue Ar-ma-ged-don. Sometimes I'm ashamed to be a Christian. How is it possible that our Savior's message on the mount could have been so distorted? Why are you judging people? Why are you not meek? Why are you not merciful? Why are you not loving Christ wherever you see him in the "least of these", the poor, the drug adicts, the gays with AIDs? Why do you cling to the obsolete 10 Commandments of the ancient Jews, instead of Christ's 2 holy commandments? How is it possible that you ignore Jesus' actual words on the mount, and live by hysterical reinterpretations of Revelation (a long-fulfilled prophecy about the destruction of the 7-headed dragon, Rome), yet call yourself a Christian? You should be called a Revelationist, not a Christian. Jesus himself warned us how it was possible: false prophets, preaching lies in his name. Read the beatitudes of Jesus, his own holy sermon, and repent, before it's too late. Concerning the last poster, I think because your whole eschatological interpretation of the Bible is that prophecy is all done and away with, it is coloring how you view other subjects posted here. Please read Preterism And Imminence before going on. Regarding the second to last poster, Jesus himself said that we should not discredit prophecies, but test them. You think the quotes about stoning the Satanists are unmerciful and unloving, while in the New Testament is states that those who disrespect their fathers and mothers should be stoned in the same way. Yes, sinners are completely deserving of our and God's love, forgiveness, and mercy, but being meek and letting their sins continue, blind to their eyes, is not what Jesus would do, and it is not what he did.